I can always tell when the hubs has successfully petitioned for one of his clients (immigration court) bc he brings home a box of donuts. @GWillowWilson Is it worth my buying donuts tomorrow in case that would help one of his clients? Of course it would. Consider it done. But. Y’know, I was doing a little work inside a Dunkin Donuts on Thursday. My usual Dunkin Donuts “parking pass” (the purchase that gives me the moral right to sit there and monopolize their WiFi bandwidth for hours) is a Coke Zero and a cup of ice. Maybe a whole-wheat bagel, too, if I’m hungry. I thought about that Tweet. I bought myself a donut. I’ll sieze upon any excuse to buy a food item that’s not in my longterm medical best interests. I used to get a Belgian waffle with strawberries at a nearby diner every time I picked up another 1,000 Twitter followers. So, sure: I did think about how funny it would be to Tweet a photo like this a day after I promised to buy donuts. I did Tweet a photo. But when the photo was shot and I was free to dig in, I found myself thinking about all of the reasons why I support immigration. Not open borders, not immigration without any background checks: I support the fundamental idea that anybody who wants to jump through all of those hoops (which often can’t be navigated without the help of someone like Willow’s husband) should be granted a place in that long line…without prejudice. As always, when I think about immigration, I think about 75% of my mathematical allotment of grandparents. They (and their families) went through a hell of a lot to establish their new lives here. They knew that if they stayed in Europe, their grandchildren weren’t likely to grow up to enjoy the sort of ease and freedom that would permit them to waste part of their day taking photos of cheap pastry and sharing it with the world. 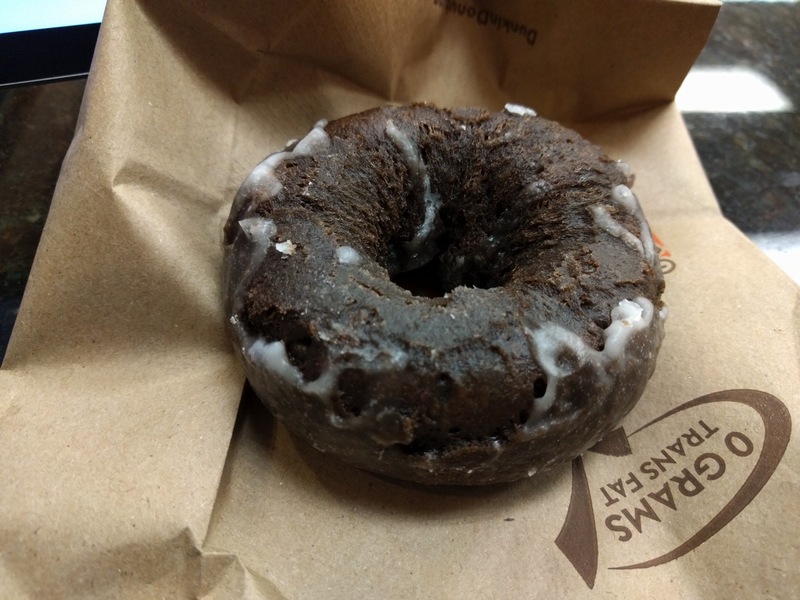 @Ihnatko I’m an immigrant and good donuts are one of the greatest things about this country. America runs on good people from everywhere. “America runs on good people from everywhere.” Honestly…that says it all. It’s so true that I didn’t even recognize it as a play on the “America Runs On Dunkin” slogan. As silly as it might sound, I imagine that I’ll spontaneously remember this exchange every time I have a donut. I’ll spend a moment giving thanks to those grandparents of mine who crossed the Atlantic in the first decades of the 20th century, and I’ll give thanks to the government that welcomed them when they arrived. My immigrant grandparents weren’t scientists carrying theories and secrets that would help the US beat the Rooskies at anything in particular. For the United States to allow these scruffy — but hard-working, good-hearted people — to settle here required a certain amount of faith that it would all work out well for the nation as a whole. I don’t know that I can say or write anything to bring anyone around to my point of view on immigration. I feel that if I deliberately tried, I’d be guilty of a certain arrogance to which I’m by no means entitled. When I write of such things, my only goal is to speak my mind. I would just like to suggest that if every one of us whose ancestors came here voluntarily were to spend an occasional moment thinking about our personal debt to the immigration process, then maybe the United States’ collective attitude would conform more closely to what it says on the side of the box. We are truly a nation of immigrants. It’s a shame so many have forgotten this. Yes, I’m conveniently ignoring the Native American issue! Our ancestors did some horrible things.